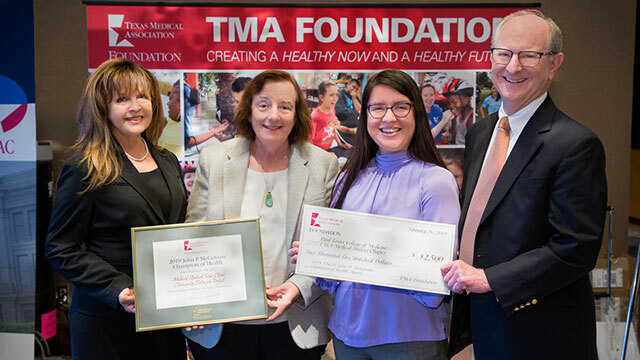 The Paul L. Foster School of Medicine’s Medical Student Run Clinic garnered second place in the Texas Medical Association Foundation’s prestigious 2019 John P. McGovern Champion of Health Award competition for providing health care to El Paso County’s uninsured population. Clinic representatives were presented with the award at the TMA Winter Conference, Jan. 26 in Austin. The MSRC primarily serves residents of the Sparks community, a rural and underserved area of about 7,000. Medical students visit the Sparks Community Center twice a month to provide care for patients of all ages. Led by physician volunteers, the students conduct blood pressure, glucose, and lipids checks; screen patients for obesity; conduct Pap tests for cervical cancer and perform mammograms for breast cancer. The Champion of Health Award includes a $2,500 grant to help fund MSRC activities. The TMA recognized the students’ efforts to expand the reach of the MSRC through a planned mobile version of the clinic. The award was accompanied with a $2,500 grant to help fund MSRC activities. 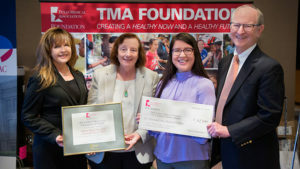 “Funding from the McGovern Award will directly support this endeavor by kick-starting a (mobile) pack-away clinic which will give students the opportunity to expand their outreach to additional sites in need of medical care,” said TTUHSC El Paso President Richard Lange, M.D., M.B.A.
Franz Puyol, a third-year PLFSOM student, said he’s pleased to see the clinic recognized for its efforts to expand health care to underserved parts of the county. “It means a lot that the TMA saw the potential of the clinic … and the work that we’re doing to serve the (Sparks) community,” he said. The pack-away clinic would be put on the road to deliver no-cost health screenings and health education to underserved communities in West Texas. “It is truly an honor and an inspiration to continue our outreach efforts in the underserved areas of West Texas, bringing services to those in need in their own communities,” said Maureen Francis, M.D., assistant dean for medical education. The award is the TMA’s highest honor and recognizes exceptional projects that address urgent public health needs and furthers the association’s mission to help physicians create a healthier future for all Texans. Established in 1995, the award has recognized local and statewide programs ranging from access to health care, cancer prevention, childhood obesity and more.